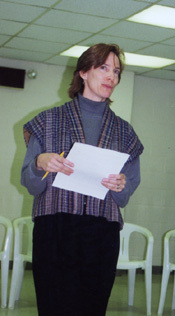 With further support from the North Carolina Humanities Council and the SOHP's "Listening for a Change" initiative, the Brown Creek Life Review Performance project took place under the auspices of BCCI's continuing education program during the spring and fall of 1998. Rouverol co-taught the first course with ACC faculty member Mark-Anthony Hines, organizing sessions around the concept of "life review" - the process by which individuals at key junctures in their lives review and assess their past. Inmates participated in a series of taped group life review storytelling sessions that focused on topics ranging from family background and childhood to young adulthood and the experience of coming to Brown Creek. Using the transcripts and their own writings, the inmates then developed a script in collaboration with Rouverol, community theater director Marlene Richardson, and ACC's Head of Correctional Education Joe Madaras. 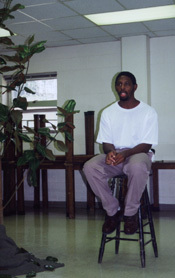 In March 1999, the inmates participated in two original performances of "Leaves of Magnolia: The Brown Creek Life Review Performance Project" for prison administration and ACC administration and staff. Rouverol is currently seeking grant support for the project's final phase: bringing at-risk youth to view the performance in the hope that hearing the inmates' narratives can positively influence their lives. Rouverol and the SOHP staff hope that the Brown Creek Life Review Performance Project will serve as a model for oral historians interested in using the life review process in their work. 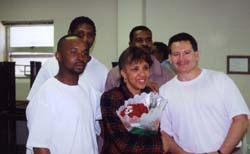 Through documenting the lives of BCCI inmates, the SOHP has also generated resource materials that will be important to scholars conducting future research on the prison experience in North Carolina during the 1990s.